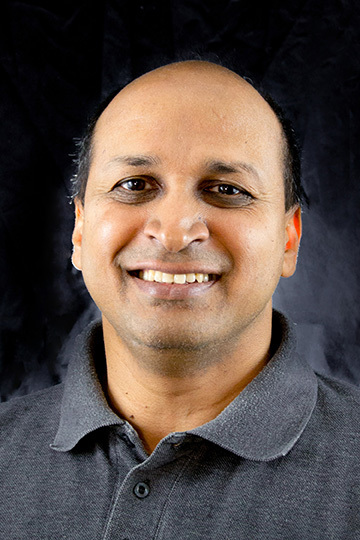 Alumnus Ram V. Iyer (EE Ph.D. 1999) has been promoted to full Professor in the Department of Mathematics and Statistics at Texas Tech University. At Maryland, Iyer was advised by Professor P. S. Krishnaprasad (ECE/ISR). Iyer has wide-ranging research interests in the areas of systems and control theory and their applications in optics, bio-engineering, and cybersecurity of critical infrastructure systems. In the area of smart structures and material modeling, Iyer works on the modeling and control of actuators based on smart materials. A key difficulty in this area is that the systems exhibit a phenomenon called hysteresis. His contribution to this area includes development of theory of hysteresis, model development from basic principles for smart materials; developing efficient and fast system identification techniques, and control design over a wide range of operating frequencies in the presence of saturation hysteresis and frequency dependent power-losses. More recently, in collaboration with researchers from University of Sannio, Benevento, Italy, he has been researching energy harvesting schemes for advanced engineering structures. Ram—who was a few years ahead of me at Maryland—and I both worked on modeling and control of hysteresis in magnetostrictive materials for our dissertations when we were Ph.D. students. We overlapped for about two years. He was instrumental in leading me into this fascinating research topic (which I gratefully acknowledged in my dissertation!). Over the years we have expanded our research interests in different directions, but the subject of hysteresis has remained an active area of research and collaboration for both of us. As part of our collaboration, we have co-organized conference sessions and a special section for IEEE Control Systems Magazine on topics related to modeling and control of systems with hysteresis. From 2000-2005, Iyer worked with the US Air Force Research Laboratory on problems relating to control of hypersonic and unmanned air vehicles. He realized that existing inertial navigation systems were inadequate for micro air vehicles and developed a completely novel sensing idea based on insect vision. This led to an enduring interest in optics. With Dr. Steven Matthews, O.D., Ph.D., Iyer has been developing custom contact lenses for keratoconic patients, who have a progressive thinning of the cornea. His contributions include developing a smoothing spline method on disk domains for the reconstruction of the corneal surface from optical coherence tomography measurements, and robust front surface design for contact lenses that take into account translation and rotation of the lenses while providing significant vision correction. From a mathematical perspective, this project has led Iyer and his student to develop theoretical understanding of dissipation processes in low dimensional Reynolds number flow involving capillary surfaces, and contact angle hysteresis. Recently Iyer has advised M.S. and Ph.D. students in the area of modeling the dynamics of human eye motion; smoothing of rigid gas permeable contact lenses after wavefront aberration correction; smoothing spline models for creating 3D model of the cornea from optical coherence tomography (OCT) measurement; and mathematical modeling and analysis of the static and dynamic stability of the contact lens/tear/lens system. Iyer also has been working with a large group of faculty from Engineering, Arts and Sciences, and Business, on the cybersecurity of networked critical infrastructure systems. Critical infrastructure such as oil, gas, and water pipelines; the smart electricity grid; and the national highway network, are vulnerable to cyberattacks due to their networked nature. Although features of information assurance apply to this area due to its networked nature, the key feature that can be exploited to defend networked critical infrastructure systems is the constraint imposed by its physical nature. The group's aim is to understand vulnerabilities due to legacy systems, make the networks resilient to cyberattacks with designed-in security features, and educate the next generation of cybersecurity engineers. Congratulations to alumnus Ram Iyer on this well-deserved promotion in his very fruitful academic career!